The second recipe that I tested for the Food52 website this week is this delicious little bite of some unexpected ingredients. The original recipe is here. This recipe took a little more effort than the kalamata olive tapenade crostinis, but I was excited to learn something new: making homemade cheese crackers! I had no idea that making homemade crackers would be so easy–it’s basically the same process as making a pastry crust–and it can easily be made in a food processor. 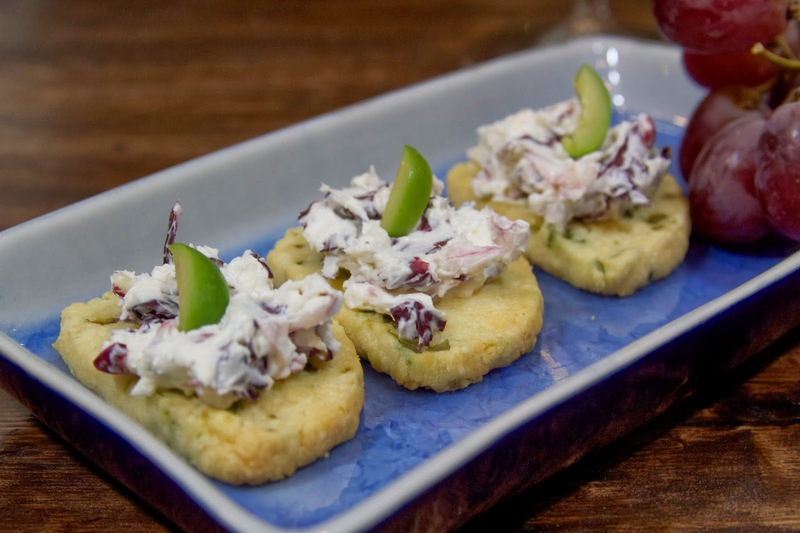 The cracker is then topped with a mixture of radicchio and cream cheese. Radicchio is a very assertive (ok, bitter) lettuce, but it becomes wonderfully mellow when mixed with the cream cheese. What I also loved about this recipe is that it uses castelvetrano olives! I may have mentioned my love for these olives before–bright green and buttery, they were a perfect compliment both inside the cheese cracker and in the garnish. Do yourself a favor and buy the olives already pitted–it will make the process that much easier. I found an enormous jar of them at Costco and they were such a great price, I had to buy them. I’m going to have to find a lot more things to make with these olives! Since I was testing this recipe, I stuck very close to the original recipe, with very few changes. 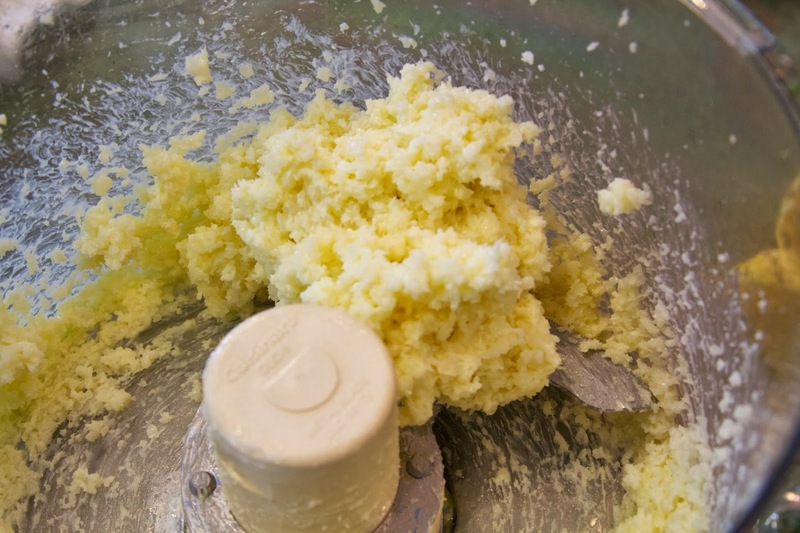 Combine the butter, olive oil and cheese in the food processor and pulse until well combined. Combine the flour and baking powder in a small bowl and mix well. Add the flour mixture to the food processor and pulse until the mixture looks crumbly. 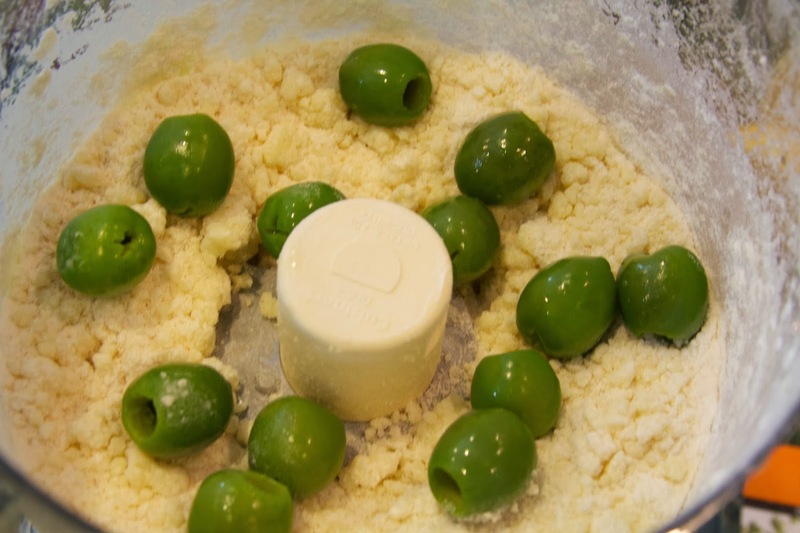 Sprinkle the olives and the brine on top of the mixture in the food processor and pulse until the olives are thoroughly incorporated and there are no large pieces of olive. 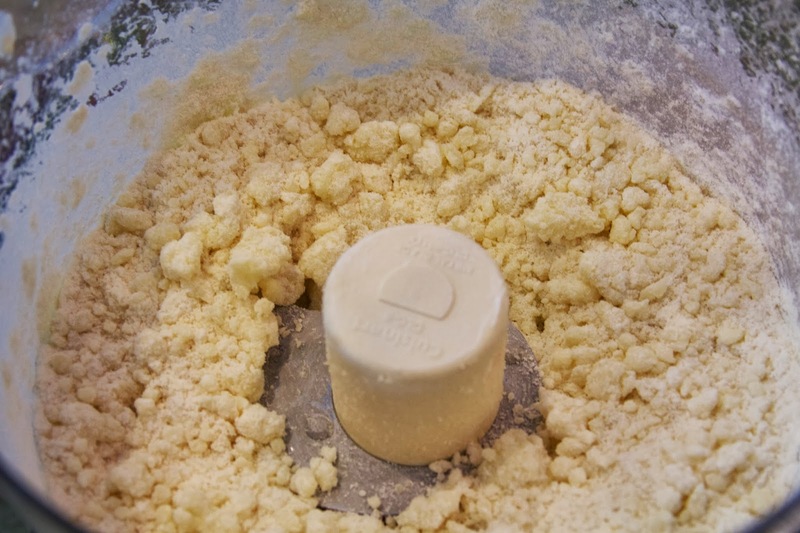 The mixture should still be crumbly, but when you pinch it, it should hold together. I used two teaspoons of olive brine in the mixture in order to get it to the proper consistency. Pour the mixture onto a piece of wax paper or plastic wrap and shape into a log. Place the log in the freezer for about 30 minutes. Slice the dough into 1/4 inch thick slices and place them on a baking sheet lined with parchment paper. Using a fork, poke two sets of holes in the top of the cracker. Bake in a 350 degree oven for approximately 25 minutes, or until golden brown. Rotate the pan halfway through cooking so that the crackers bake evenly. Transfer to a cooling rack and allow them to cool before topping with the creamy radicchio mixture. First, prepare the radicchio by slicing the head in quarters. Remove the core first, then cut the quarters into thirds. Slice the thirds horizontally in thin slices. 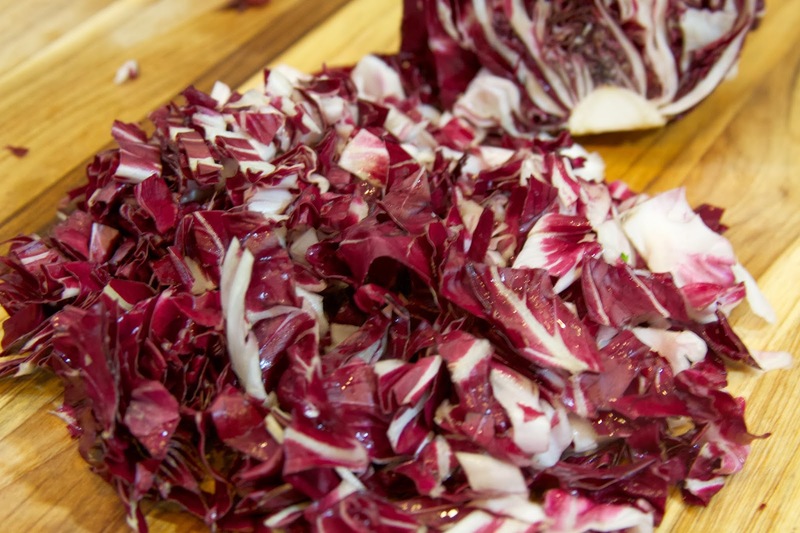 Soak the radicchio in ice water for 15 minutes, then spin it dry in a salad spinner. Soaking the radicchio is a very important step as it helps to temper its bitterness. Mix together the cream cheese, lemon zest, pepper in a bowl. Add the radicchio and stir to combine. 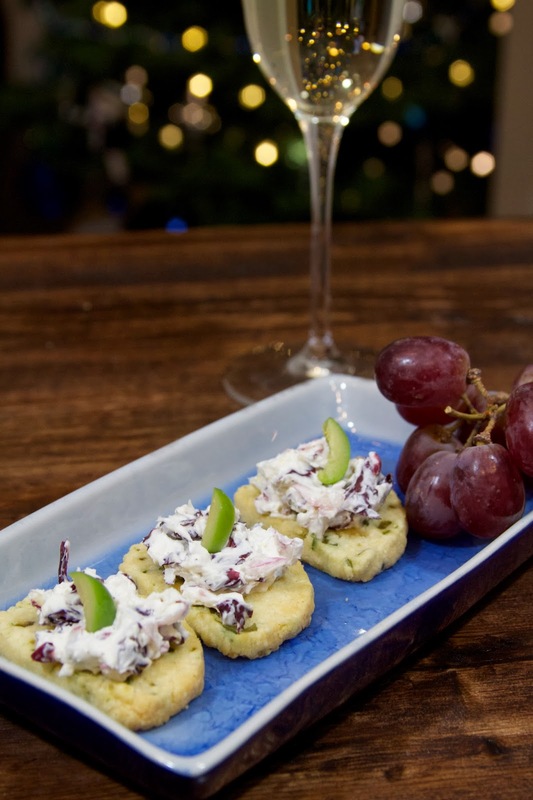 To assemble the hors d’oeuvres spoon about a teaspoon of the cream cheese mixture on top of each cracker, then top with a sliver of olive. I have it on good authority (my own) that this little bite is perfect with a crisp white wine or champagne!